Florida is best known for its beaches, parks, historic sites, and other attractions that inspire millions of individuals to visit the state each year. The weather is reason alone to want to relocate, at least during the winter months. The northern part of the country will be enduring temperatures below 30 degrees. However, those in the Sunshine State will be enjoying temperatures between 60 and 70 degrees. Before moving to or visiting the state, there are a couple of things to keep in mind. In either case, many people will want to take their car with them. However, it is important to consider how you will you be getting your car to Florida. Shipping your car provides an easy, fast, and affordable solution. This method of transport is the standard method utilized by most customers. If you choose this option, then the vehicle will be loaded onto an open-air carrier for transport to its destination. These carriers are not enclosed, meaning that the car will be exposed to road elements and weather. Learn more on open auto transport. This method of transport shields the vehicle from weather and road elements, such as dust, dirt, and grime. It provides more peace of mind, but it is more expensive than the standard method of auto shipping. 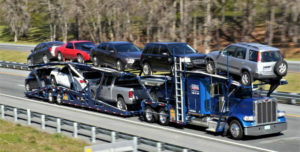 Enclosed auto transport is recommended for those individuals who are shipping high-value vehicles. Learn more on enclosed auto transport. With this service, the car will be picked up directly from your home and delivered to its destination. This option provides our customers with added convenience. It eliminates the hassle of driving to a terminal for pickup of the vehicle, saving you time. Learn more on door-to-door auto shipping. Your vehicle does not have to be able to run in order for us to transport it. However, it does help if it has rolling, steering, and braking capabilities. The shipment of an inoperable car is more expensive due to the additional time, equipment, and manpower needed for transport. Learn more on non-running vehicle shipping. Although Florida is a mid-sized state, it is still quite large, offering a variety of culture and landscapes. It is more than just the weather that attracts visitors to the state. However, the weather does make it the perfect destination spot for snowbirds, or people temporarily relocating to a warmer climate during the winter months. Florida is a popular destination for retirees, but the Sunshine State has much to offer people of all ages. We have assembled a list of the most popular cities in Florida. Read up a little on what each city has to offer its residents and visitors. Learn more about Florida Travel and Tourism. Home to Cuban food. Not only does the city offer Cuban cuisine, but there are other Latin American options available, as well. Attracts art enthusiasts. Not only does Miami have numerous museums, but there is also an event, known as Art Basel, that showcases art from around the globe. Flooding can occur. Due to the location of the city, flooding is a possibility. During Hurricane season, you should take the proper precautions to protect yourself and your property. Learn more about news and events going on in Miami, here. Great education. Orlando is home to the University of Central Florida, the nation’s second largest university by undergraduate enrollment. Walt Disney World. The most popular tourist attraction in Florida is Disney World, which is located in the city. Traffic. This isn’t a positive, but it is certainly worth mentioning. Due to the popularity of the amusement parks, driving can be a pain. Learn more about news and events going on in Orlando, here. Yacht life. The city is filled with waterways. This makes it the perfect community if you own a boat. Fun festivals and events. There is always something fun going on, whether it be an art show, food festival, music concert, or comedy show. High cost of living. Compared to the rest of the state and nation, homes tend to be on the more expensive side. Learn more about news and events going on in Fort Lauderdale, here. Has 3 Major Leagues. If you love sports, this is the city for you. Tampa has 3 Major League sport teams, including the Tampa Bay Buccaneers, Tampa Bay Lightning, and Tampa Bay Rays. Attracts animal lovers. Tampa is home to the Tampa Lowry Park Zoo. When making a trip, be sure to check out the Giraffe Feeding Station. Hot and humid. Like most parts of Florida during the Summer, temperatures can reach into the high 90s. Learn more about news and events going on in Tampa, here. Place for water lovers. There are plenty water activities to enjoy and plenty locations to do so, including the ocean, lake, and river. Cruising City. If you are a frequent cruiser, you won’t have to travel far. Jacksonville is one of five cities in Florida that offers a port for cruise ships. Traffic. The city has a large population with many roads. This can make it difficult to get from place to place without getting into a traffic jam. Learn more about news and events going on in Jacksonville, here. Are you in need of auto shipping services to or from Florida? National Dispatch is a nationwide auto transport company. Request a free, instant car shipping quote, today. No personal information is required. Use our online quote calculator, located on our website for an auto shipping quote in seconds. We can also be contacted by phone at 800-321-2051.